Atlas and the Anchor: Portugal. 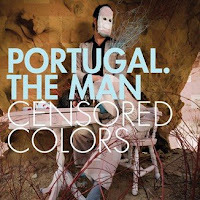 The Man - "Censored Colors"
Vice President hopeful Sarah Palin may be Alaska's favorite daughter, but Portugal. The Man are their prodigal sons. On their third album, and first for Equal Vision Records, Portugal. The Man continue to color outside of the lines of classification with, "Censored Colors". The album is split into two halves with the first half centering more on disparate, Gospel fueled folk and psych-pop than the Mars Volta-like art rock of their past. While the second half is a seamless suite of the freaked out prog, jazz, and metal they are known for. "Lay Me Back Down" opens the album on a rush of thick vintage 70's organ and a Jack White-like guitar riff with Gospel tinged background vocals, signaling the shift in style. Though the music, ever changing and abstract, one constant remains in the falsetto vocals of John Baldwin Gourley. Those vocals are showcased in the up-lifting classic soul of "Created". The rock remains, but is more in line with the stomp and pomp of Led Zeppelin and the hazy trippiness of Pink Floyd. To highlight the strangeness of the second half, "1989", a spacey, country-esque ballad about Gourley's childhood recollection of the Gulf War, ends in a reggae-like sing along. Setting them apart from everyone else is Portugal. The Man's ability to change with every album, each year and to surprise their fans with a curveball every time.